Harley just turned 4 in May. He is totally blind from untreated dry eye, and his sight will not come back. He is easy to work with and is very grateful for any and all petting and attention. Just a sweet dog who deserves better than he has had. 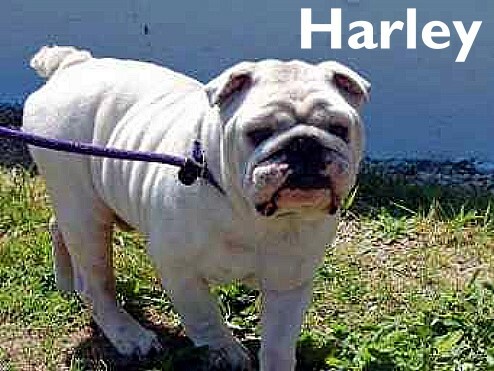 Harley had his neuter (ouch) and lower lid entropian surgery last Friday. The eye surgery will not bring back his sight but it will make him more comfortable. He has gained about 10 lbs and has learned "Blind Dog" skills very rapidly! Harley can now manuver on voice and leash commands and is very happy in his foster home. He is learning to play with toys and is looking like the young Bulldog he is! We are ready to start considering applications for his forever home! Please be sure to fill out the application to adopt before contacting us. Harley will need eye drops twice a day for the rest of his life. He will also need a home with no full staircases. He can handle a couple of stairs, but a full staircase is a danger to him. He would be an outstanding candidate for someone who wanted to do Therapy Dog work with him. Just a delightful boy! Harley just turned 4 in May. He is totally blind from untreated dry eye, and his sight will not come back. He will need to be on eye medication daily for the rest of his life to help keep the eye moist and more comfortable. He is getting surgey on Friday for his neuter and some eyelid correction. Harley is about 6 lbs under weight and has just been neglected. The dry eye that caused his blindness was treatable, but no one could get around to it. He is house trained, excellent in the crate, very good on the lead, and is quickly learning "blind dog" commands! He is a very sweet dog who gets along with other dogs and loves people! Harley will need a special home with people who will be consistant with his eye medication and work with him to help him to acclimate to a new home. Fenced yard and minimal steps...no staircases! Harley will fall down them! he can handle 1 or 2 steps when he is on a lead. He is easy to work with and is very grateful for any and all petting and attention. Just a sweet dog who deserves better than he has had. Please have an application filled out before contacting us!!! ADOPTION FEE, HOME CHECK, REFERENCE CHECK, VET CHECK APPLY. WE DO NOT ADOPT FURTHER THAN 1 HOUR FROM ST. LOUIS MO METRO AREA.